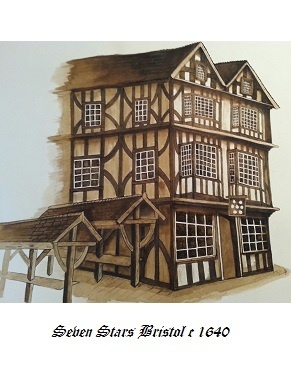 In the early 1600s, John Yeamans owned Bristol’s largest brewery which undoubtedly supplied the Seven Stars. Yeamans brewing interests were later acquired by the Saunders family who became the dominant brewer in and around the city for the next hundred years. 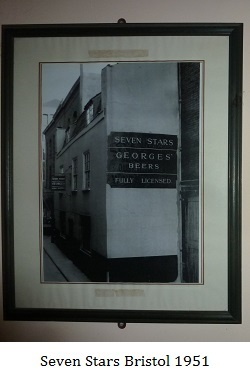 By 1788 the Seven Stars was part of The Porter Brewery (founded by Isaac Hobhouse in 1730) that became Georges, Rickettes & Sons in 1816, later incorporated as The Bristol Brewery Georges & Company Limited in 1866. The breweries organic growth together with the acquisition in 1889 of James & Pierce, The Bedminster Brewery, in 1911 that of R.W. Miller The Stokes Croft Brewery, in 1912 The Lodway Brewery of Messrs. Hall & Sons, situated at Pill, in 1918 The Brewery of John Arnold & Sons, Wickwar, in 1919 The Welton (Somerset) Brewery, Chippenham, The Ashton Gate Brewery Co. Ltd. in 1932, the Bath Brewing Company in 1923, Slade’s Brewery in Chippenham in 1926 and finally in 1956, control of their only remaining rivals Bristol United Breweries Ltd saw the company own and control close to one thousand pubs, taverns and inns in and around Bristol. In the summer of 1961 the Bristol Brewery Georges & Co Ltd was taken over by the London based brewing firm of Courage Barclay & Simonds Ltd, thus finally removing the last independent brewer in the city. 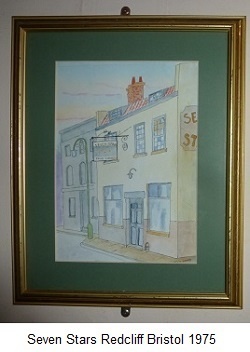 Ushers of Trowbridge, renamed Ushers Brewers Ltd in 1964 was the last brewer that controlled the Seven Stars, and in early 2000 it reverted to being the freehouse it had been some 300 years before. So with thanks to many, but not forgetting Bristols Lost Pubs and Kevin Brice here are landlords and landladies of the Seven Stars.